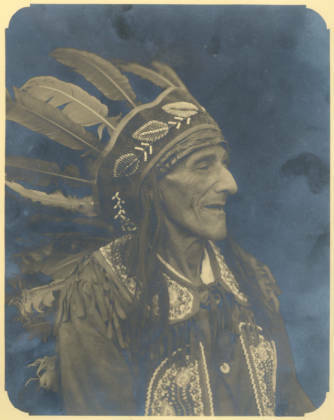 Portrait of Bill Moose Crowfoot in head dress and beaded tunic, 1930. He is regarded to have been the last of the Wyandot people who lived in Central Ohio. He was born in 1837 in northwest Ohio and moved to the Columbus area with his family when most of his tribe was displaced to Kansas and later to Oklahoma. He was known to have wandered the area around the Olentangy and Scioto rivers. He later lived in a small shack at the corner of Indianola and Morse Roads. The Wyandot people originally lived in southern Ontario. They were also called Hurons, but they called themselves "Wendat" which in time became "Wyandot" or "Wyandotte." The Wyandot were related to the Iroquois, but in the years before European settlement, the Iroquois Confederacy attacked them and drove them from their homeland along the Georgian Bay. Some came to live in northern Ohio. They built their main villages in Wyandot, Marion, and Crawford Counties, but they lived across northern Ohio and as far south as Ross County. Like the Algonquians, the Wendat were a confederacy of multiple peoples who spoke Wyandot languages, which were related to the Iroquois language. The Wyandots had a special friendship with the Shawnee tribe. They referred to the Shawnee tribe as their "nephew" or "younger brother." Their alliances with other American Indian peoples in the Ohio Territory changed with the times. The Wyandots were allies of the French until British traders moved into Ohio Country circa 1740. The French pushed the British out of Ohio, and the Wyandots became allies of the French again until the British victory in the French and Indian War. But as French trading posts turned into British forts, the Ohio tribes banded together to fight the British in Pontiac's Rebellion in 1764. During the American Revolution the Wyandots fought for the British against the Americans. When the British surrendered, the American Indians were left to fight the Americans on their own. According to the Anglo-American historical record, the Wyandot were regarded as fierce warriors. Colonel William Crawford led an expedition against the Wyandot town at Upper Sandusky in 1782. His army was defeated and the Wyandot captured Crawford and burned him at the stake. Anglo-American lore holds that General Anthony Wayne once ordered Captain William Wells to go to the American Indian town at Upper Sandusky and bring in a prisoner who could tell them about the American Indians' plans. Captain Wells replied that he "could bring in a prisoner, but not from Sandusky, because there were none but Wyandots at Sandusky and they would not be taken alive." General Anthony Wayne defeated the Wyandots and other Ohio American Indian peoples at the Battle of Fallen Timbers in 1794. The Wyandot surrendered most of their lands in Ohio with the signing of the Treaty of Greenville. Lands in Southeastern Michigan and Northwestern Ohio were ceded with the Treaty of Detroit in 1807. In 1842, under the increasingly aggressive U.S. Indian Removal policy, the Wyandots were made to give up their claims to their reservation at Upper Sandusky. The treaty also required the Wyandot to sell their land for less than its fair market value. In 1843 the United States government sent the Wyandot off to a reservation in what became Wyandotte County, Kansas. The Wyandot purchases these lands from the Delaware. The Wyandot were the last American Indian group to formally leave Ohio (although it should be noted that at least some members of almost all American Indian peoples with historic ties to Ohio remained in the state during the period of removal.) After the Civil War, the Ohio Wyandot were removed to Oklahoma. Tarhe and Leatherlips were notable Wyandot leaders. The Wyandot have four bands with recognition in the U.S. and Canada: the Wyandotte Nation (Oklahoma); the Huron-Wendat Nation (First Nation in Canada); and the Wyandot Nations of Anderdon (Michigan) and Kansas, which are recognized at the state level. In February of 1985, the U.S. government delivered $5 million dollars to descendants of the Wyandot people in partial compensation for the exploitative treaty of 1842.